Easter is coming up and I thought it was the perfect time to make something for Spring! Beanies and mittens have their time, but Spring is more about toys and fun little accessories that you won’t overheat in. 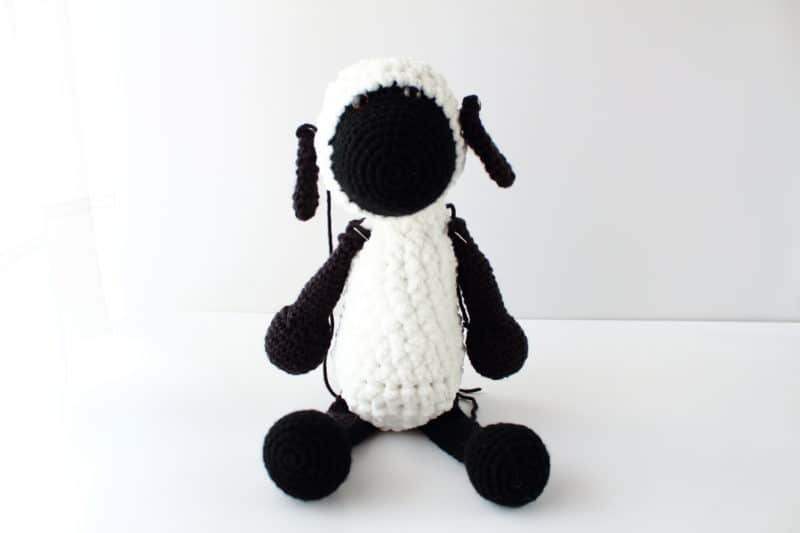 This week, I have the cutest crochet sheep to share with you. 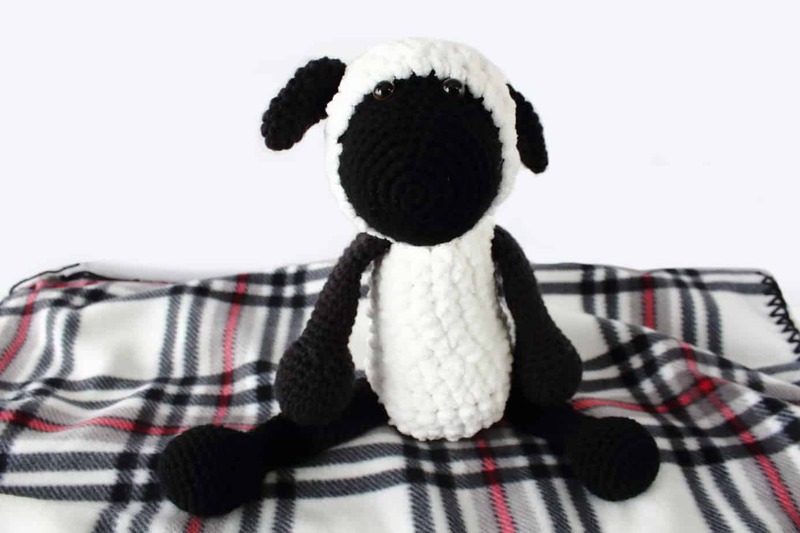 This is a free amigurumi pattern for Sammy the Sheep, and he is so easy to work up! 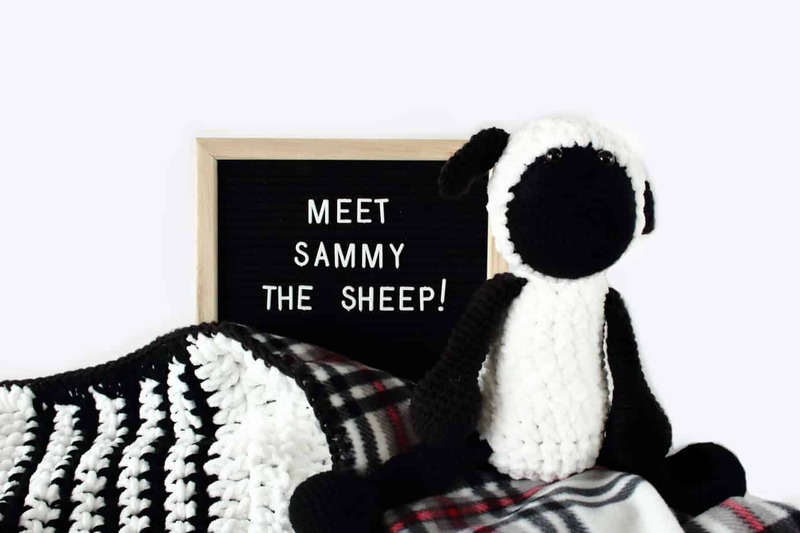 Most amigurumi patterns use small stitches and yarn, but Sammy is made of super soft and fluffy blanket yarn, a larger hook, and he’s perfect for cuddling! Recently, I was working on a blanket a few weeks ago using Bernat blanket yarn and some worsted weight black yarn. I had little bits of each leftover and usually, I just save that and use it later. 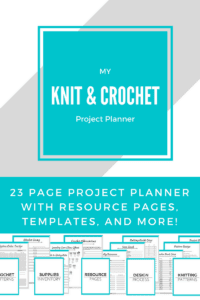 This time, I knew I didn’t have enough for a full blanket and I really didn’t want to buy more just to use it up; but there was also more than just scraps I would toss. 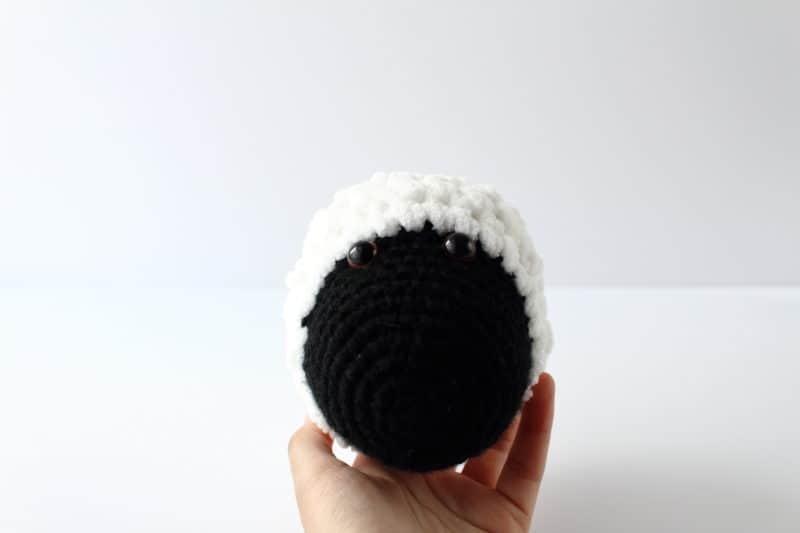 So I sat there looking at it and I realized this yarn was the perfect texture for a sheep! It was so fluffy and soft that I wouldn’t even need to fuzz it out to get the sheepy look. So I played around with it and this free amigurumi pattern is what I came up with! 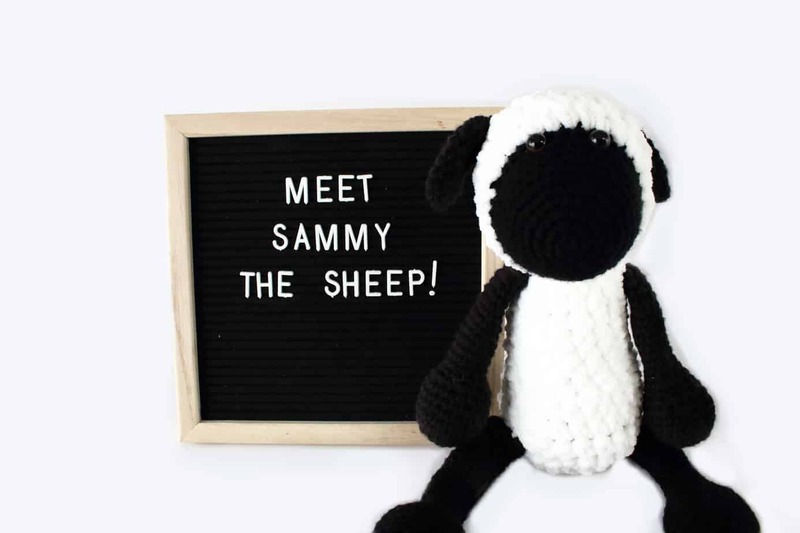 This free amigurumi pattern for Sammy is a little different than most crochet amigurumi but in a way that actually makes it easier to recreate. As I said, I used a blanket yarn for the texture which meant I also used a bigger hook. 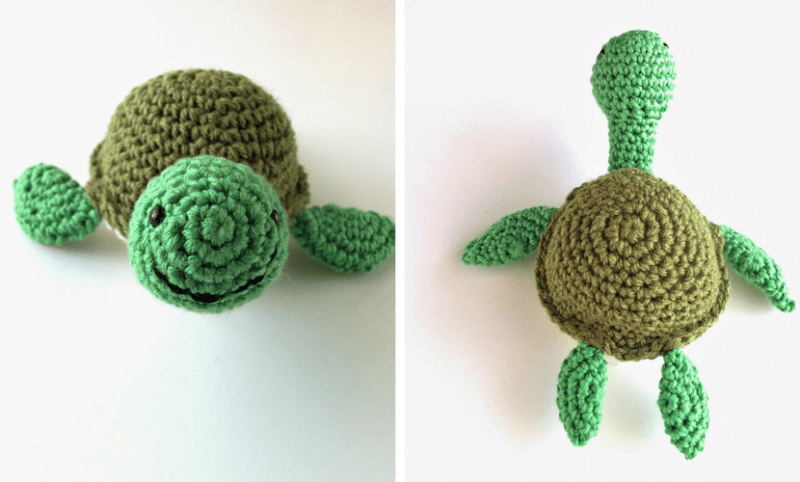 If you have a hard time with tiny hooks and stitches for amigurumi, this is going to be so much easier on your hands and it works up faster. The * marks affiliate links. If you purchase through my link, I earn a small commission at no extra cost to you and it goes into helping me run this blog. For this pattern, we’re going to make all of the pieces first, and then attach them at the end. Round 1: With the black yarn and a 4.00mm hook, create a magic loop and work 6 SC into it. Pull the loop closed and mark the first stitch with a stitch marker. Round 2: Work 2 SC into each space (12). Round 3: *SC in the first space, increase into the next* and repeat this all the way around (18). Round 4: *SC 2, increase* and repeat this around (24). Round 5: *SC 3, increase* and repeat this around (30). Round 6: *SC 4, increase* and repeat this around (36). Rounds 7-13: Work 7 rounds of SC evenly around the head. 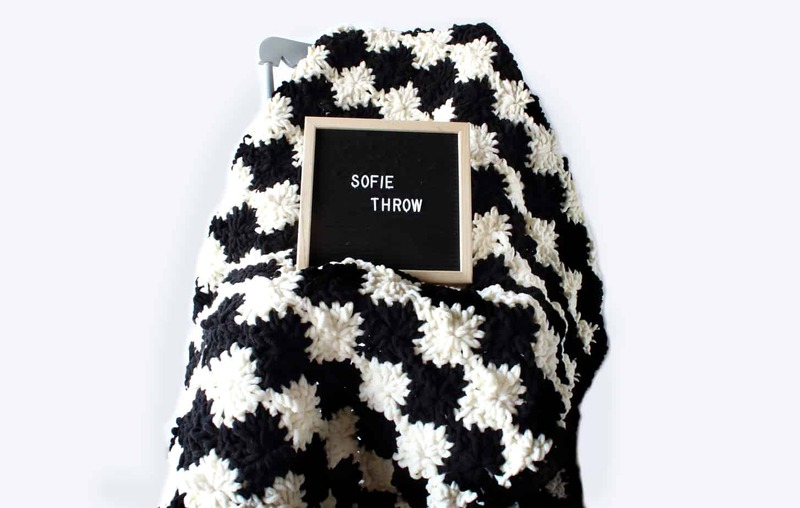 Switch to the thicker blanket yarn and an 8.00mm crochet hook. Rounds 14-15: Work 2 rounds of SC using the white yarn. It might be tricky to get the hook through if you worked too tightly, but give it a wiggle and you should be able to get it through. Mark the position of the eyes here. If you use safety eyes, you can insert them now, but don’t close the backs yet. Or use scrap yarn to mark the position for now and you can add the eyes later. Round 16: *SC 4, decrease* and repeat this around (30). Round 17: *SC 3, decrease* and repeat this around (24). Add the stuffing to the head now. Finalize where you want the eyes to be, and secure the backs to the safety eyes. Round 18: *SC 2, decrease* and repeat this around (18). Round 19: *SC 1, decrease* and repeat this around (12). Round 20: Decrease around (6). Finish stuffing as much as you like and bind off. Weave in the ends and trim the excess yarn. 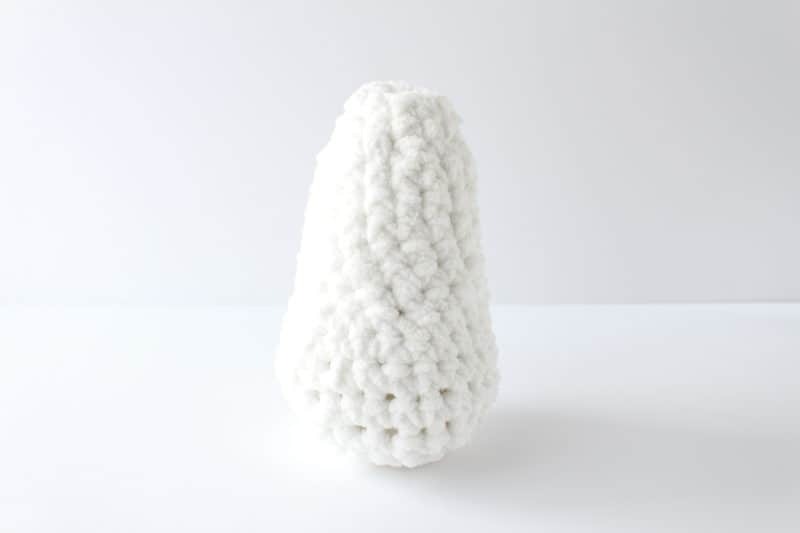 Round 1: With the white yarn and an 8.00mm hook, create a magic loop and work 6 SC into it. Pull the loop closed and mark the first stitch with a stitch marker. Rounds 5-7: SC around for 3 rounds. Round 8: *SC 2, decrease* and repeat this around (18). Rounds 9-14: SC around for 6 more rounds. Round 15: *SC 1, decrease* and repeat this around (12). Round 16: SC around for 1 round and bind off, but leave a long tail to use when you sew the head on later. Rounds 4-8: SC around for 5 rounds. Round 9: *SC 1, decrease* and repeat this all the way around (12). Add stuffing to the bowl shape here. Rounds 10-28: SC around for 19 rounds. The bind off and leave a long tail to sew the legs on with later. Work the arms the same way as the legs, but stop at Round 24 so they’re slightly shorter. You could also make them the same size, but I liked them shorter. And last but not least, Sammy needs ears! Round 1: With black yarn and a 4.00mm hook, create a magic loop and worth 4 SC into it. Pull the loop closed and mark the first space. Round 2: Increase in each space (8). Rounds 3-4: SC around for 2 rounds. Round 5: *SC 1, increase* and repeat this around (12). Rounds 6-7: SC around for 2 rounds. Round 8: *SC 1, decrease* and repeat this around (8). Round 9: Decrease around (4). Bind off and leave a long tail to sew the ears onto the head. Okay, now that we’ve finished all the parts of this free amigurumi pattern, it’s time to assemble everything! Start with the ears and position one ear on either side of the head. Use pins to hold them in place and make sure they’re even! As you can see, one of mine was slightly higher than the other, but it’s not that big a deal. Thread the tail yarn through your tapestry needle and begin sewing around the post of the stitches in the head and through the stitches of the ear. So go under both stitches with the ear flat. Once you get to the end of the ear, secure your yarn and hide the tail ends and trim the excess. You’re also going to attach the arms the same way. I positioned my arms to the send to last round so they were at the same level. Attach the legs to the base of the body in the same way. I used the last increase round to mark where I placed the legs, but I tried to keep them on the sides of the body so the legs would go sideways when he was sitting and straight down when he was being held. 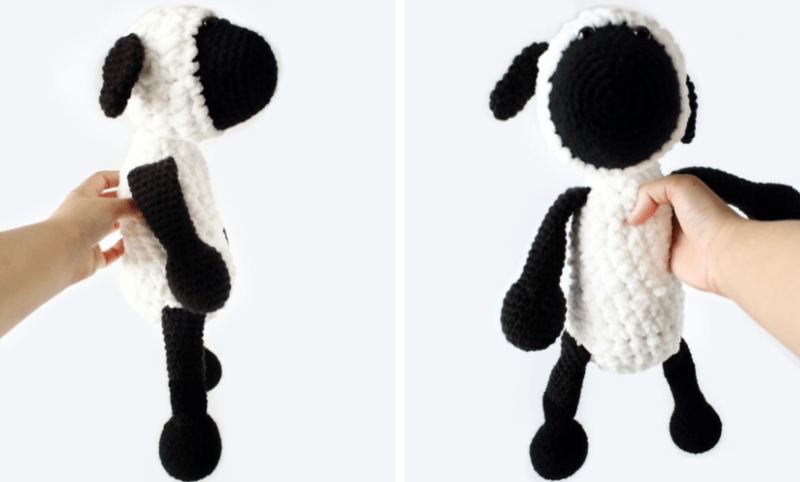 Lastly, we need to attach the two halves of this free amigurumi pattern. 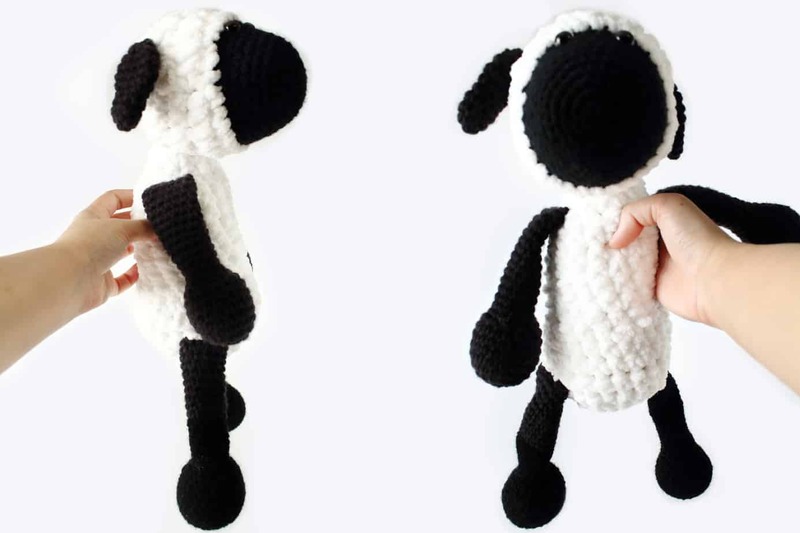 Use the white yarn tail from the body to attach the head. Use pins to hold it in place and make sure it’s facing forward. Then just sew around, attach the head and the body together. Secure the yarn once you’ve gone all the way around and weave in the ends. Finally, trim the excess yarn to finish. 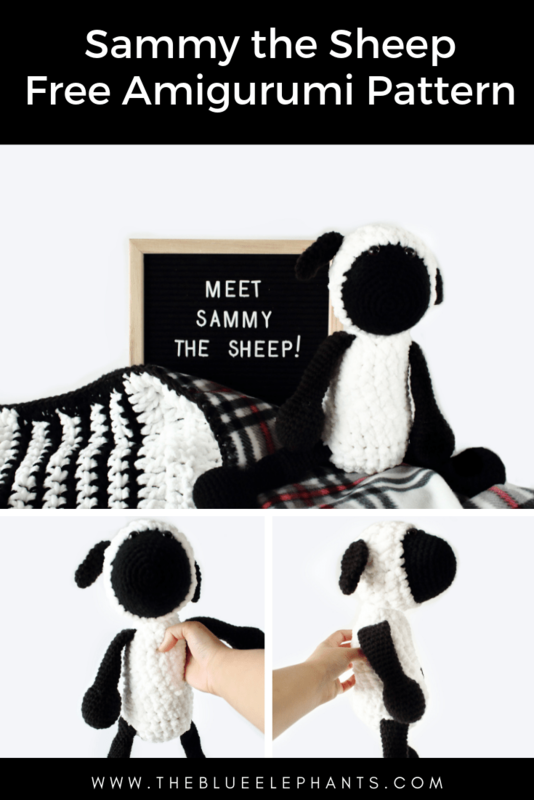 I love how Sammy the Sheep turned out and he’s going to be the perfect little companion for the baby I’m making this blanket for. The pattern for the blanket is coming soon, but I still have a few finishing touches to add. If you liked this, then please subscribe to the newsletter using the box below! 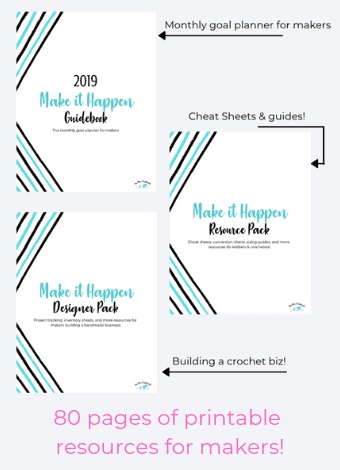 You’ll get new patterns delivered to your inbox every week, along with tips, freebies, and access to the resource library. 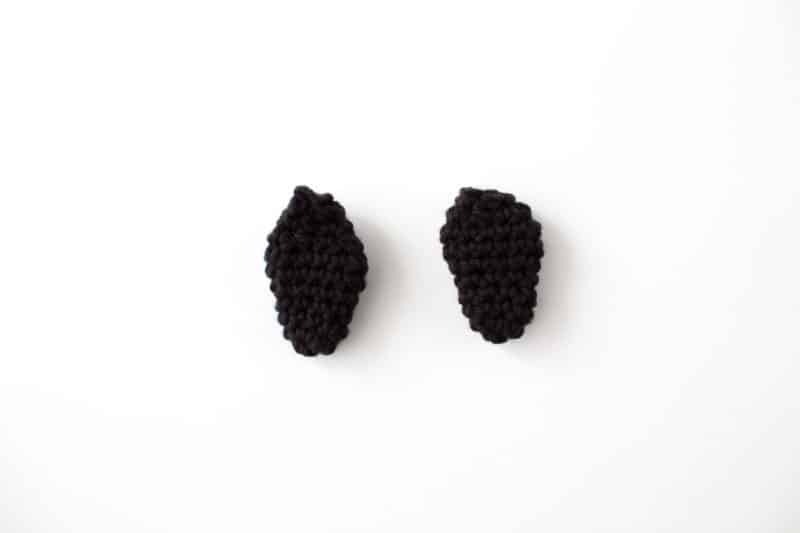 I have free amigurumi rabbit pattern coming next week, so stay tuned to that. Sammy is adorable! Thanks for sharing your pattern!